Chromosomal translocations are hallmarks of various types of cancers and leukemias. However, the molecular mechanisms of chromosome translocations remain largely unknown. The ataxia-telangiectasia mutated (ATM) protein, a DNA damage signaling regulator, facilitates DNA repair to prevent chromosome abnormalities. Previously, we showed that ATM deficiency led to the 11q23 chromosome translocation, the most frequent chromosome abnormalities in secondary leukemia. Here, we show that ARP8, a subunit of the INO80 chromatin remodeling complex, is phosphorylated after etoposide treatment. The etoposide-induced phosphorylation of ARP8 is regulated by ATM and ATR, and attenuates its interaction with INO80. The ATM-regulated phosphorylation of ARP8 reduces the excessive loading of INO80 and RAD51 onto the breakpoint cluster region. These findings suggest that the phosphorylation of ARP8, regulated by ATM, plays an important role in maintaining the fidelity of DNA repair to prevent the etoposide-induced 11q23 abnormalities. Chromosome translocations are one of the most common types of genetic rearrangements induced by DNA damaging agents, such as ionizing radiation and certain chemotherapies. The presence of disease-specific chromosome translocations, especially in hematological malignancies such as the t(9;22) or Philadelphia chromosome in chronic myelocytic leukemia, has been reported. Molecular studies of the breakpoints of such disease-specific chromosome translocations have revealed the clustering of the breakpoints in specific regions, designated as the breakpoint cluster region (BCR). In lymphoid malignancies, the involvement of the physiological recombination of immunoglobulin and T-cell receptor genes in chromosome translocations has been suggested, due to the presence of signal sequences for the recombination at the breakpoints. However, the molecular mechanisms of chromosome translocations in other cell types remain largely unknown. Chromosome translocations arise as a consequence of errors in the repair of DNA double strand breaks (DSBs). Eukaryotic cells utilize a variety of repair pathways for DSBs, including two major ones, non-homologous end joining (NHEJ) and homologous recombination repair (HR). In the absence of these canonical pathways, the activation of the alternative NHEJ (Alt-EJ) pathway and the inactivation of DNA polymerase theta are implicated in chromosomal translocations (Zelensky et al., 2017) (Mizuno et al., 2009; Ruiz et al., 2009; Schmidt et al., 2006). In contrast, HR is regarded as a precise DSB repair system, since either the intact sister chromatid or the homologous region is used as the template for repair. However, both the depletion and overexpression of the RAD51 recombinase, a key factor involved in HR, lead to chromosomal abnormalities (Reliene et al., 2007; Richardson et al., 2004). Therefore, the precise regulation of the recombination activity is also required for DNA repair to prevent chromosome translocations. DNA damage leads to the activation of the DNA damage response and repair pathways. The ataxia-telangiectasia mutated (ATM) protein regulates the DNA damage response in reaction to DSBs, through its kinase activity (Clouaire et al., 2017; Guleria and Chandna, 2016; Shiloh, 2003; Shiloh and Ziv, 2013). Alterations in the function of ATM play pathologic roles in the development of leukemia/lymphoma and cancer (Khanna, 2000; Oguchi et al., 2003; Reliene et al., 2007). Chromosome translocations involving the MLL gene on 11q23 are the most frequent chromosome abnormalities in secondary leukemia associated with chemotherapy employing etoposide, a topoisomerase II poison. An increase of 11q23 translocations is observed in the ATM kinase activity-deficient fibroblast cell line AT5BIVA (Nakada et al., 2006). We showed previously that a deficiency of ATM, a DNA damage signaling kinase, led to the excessive binding of RAD51 and the chromatin remodeling factor INO80 to the BCR in the MLL gene after etoposide treatment (Sun et al., 2010). INO80 is conserved in eukaryotes and acts as an integral scaffold for assembling other proteins into the INO80 chromatin remodeling complex (Chen et al., 2011; Morrison et al., 2004). The INO80 complex plays an important role in chromatin reorganization for transcription (Lafon et al., 2015; Xue et al., 2015), replication (Falbo and Shen, 2012; Vassileva et al., 2014) and DNA repair (Alatwi and Downs, 2015; Gospodinov et al., 2011; Morrison et al., 2004; Seeber et al., 2013; van Attikum et al., 2004). The INO80 complex is required for effective DNA end resection at the early stage of HR in budding yeast and human cells (Gospodinov et al., 2011; Lademann et al., 2017; Tsukuda et al., 2005; Tsukuda et al., 2009; van Attikum et al., 2004). Therefore, we speculated that the decreased fidelity of DNA repair by the inappropriate regulation of HR repair in ATM-deficient cells could lead to chromosomal translocations. However, the mechanism by which ATM deficiencies induce the excessive binding of INO80 and RAD51 to the BCR after etoposide treatment remains to be clarified. INO80 forms a chromatin remodeling complex with more than 15 subunits (Jin et al., 2005; Shen et al., 2000). Among the subunits of the INO80 complex, ARP8 functions as a nucleosome recognition module and enhances the nucleosome-binding affinity of the protein complex (Saravanan et al., 2012; Shen et al., 2003). In this study, we found that ARP8 is required for the binding of INO80 and RAD51 to the BCR in the MLL gene after etoposide treatment. We also showed that the DNA damage-dependent phosphorylation of ARP8 is regulated by ATM and ATR after etoposide treatment. The ATM-dependent phosphorylation of ARP8 negatively regulates the interaction between INO80 and ARP8, leading to the reduced binding of INO80 and RAD51 to the BCR after etoposide treatment. In contrast, ATR was not involved in the regulation of the etoposide-induced binding of RAD51 to the BCR. 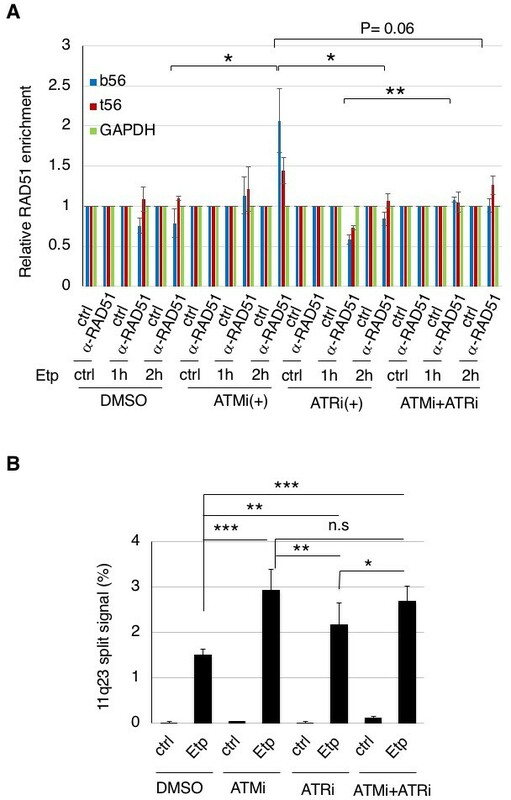 These findings suggest that ATM plays distinct roles from ATR in the phosphorylation of ARP8 to prevent the etoposide-induced 11q23 chromosome translocations, through the negative regulation of INO80 and RAD51 binding to the BCR. In our previous study, we showed that ATM deficiency resulted in the overloading of INO80 and RAD51 onto the BCR of the MLL gene after etoposide treatment (Sun et al., 2010). The finding led us to investigate the phosphorylation target of the ATM kinase, which could regulate the loading of INO80 and RAD51 onto the BCR. First, we examined the phosphorylation status of INO80 after etoposide treatment. However, we could not detect the phosphorylation of INO80 by ATM after etoposide treatment by an immunoblotting analysis (Figure 1—figure supplement 1A). Therefore, we decided to examine the phosphorylation of the subunits of the INO80 protein complex after etoposide treatment. The substrates of ATM contain the core sequence with an SQ or TQ motif (Kim et al., 1999; Matsuoka et al., 2007; O'Neill et al., 2000). By searching for SQ or TQ motifs in the subunits of the INO80 complex, we found that APR8 had an SQ motif at S412 and Q413. This motif in ARP8 is indicated as a putative phosphorylation site in the PhosphoSitePlus database (Figure 1A and Figure 1—figure supplement 1B–D). ARP8 is required for DNA binding by INO80 in yeast and mammals, and the ARP8 knockout in human cells impairs the binding of INO80 to chromatin and causes defects in DNA repair (Kashiwaba et al., 2010; Saravanan et al., 2012). Therefore, we examined whether ARP8 was the phosphorylation target of ATM. The immunoblotting analysis, using antibodies against the ATM/ATR substrate, revealed that the level of ARP8 phosphorylation was significantly increased from 2 hr after etoposide treatment (Figure 1B). The disappearance of the signal by a protein phosphatase treatment validated that the derived signal resulted from the phosphorylation of ARP8 (Figure 1B). Identification of etoposide-induced ARP8 phosphorylation and the possible responsible kinase. (A) Amino acid sequence 408 through 420 of ARP8. The Ser412 residue, within the ATM/ATR substrate motif and the CK2 substrate motif, is indicated. (B) Immunoprecipitation analysis of ARP8 phosphorylation. U2OS cells transiently expressing an empty HA vector or a vector encoding HA-tagged ARP8 were treated with DMSO (ctrl) or etoposide (Etp) for 15 min, then washed twice and cultured in complete medium for the indicated times. The nuclear extracts were incubated with anti-HA-conjugated anti-mouse IgG Dynabeads. The precipitates were electrophoresed through a gel and probed by western blotting with an anti-ATM/ATR substrate antibody or an anti-HA antibody. λPPase treatment identified the band of phosphorylated HA-ARP8. The blot of input was probed by antibodies against phospho-ATM (p-ATM), γ H2AX or phospho-RPA2 at Ser4/8 (p-RPA2). β-actin was used as a loading control. (C) Identification of the ARP8 phosphorylation site by an immunoprecipitation analysis. U2OS cells were transfected with an empty HA vector (vet), or a vector encoding HA-tagged wild-type ARP8 (WT) or HA-ARP8 S412A (S412A) for 48 hr. The cells were washed after treatment with etoposide or DMSO for 15 min, cultured in fresh medium, and harvested at the indicated time points. Whole cell extracts were used for the immunoprecipitation analysis. (D) Etoposide-induced ARP8 phosphorylation in ATM-deficient BIVA and ATM-proficient 11–4 cells. Immunoprecipitation analysis of cell extracts of BIVA or 11–4 cells transfected with HA-tagged wild-type ARP8 using anti-HA antibodies. The cells were treated with DMSO (ctrl) or etoposide (Etp) for 15 min, cultured in fresh medium, and harvested at the indicated time points. Whole cell extracts were used for the immunoprecipitation analysis, which was performed as described in (B). The amounts of phosphorylated ARP8 and HA-ARP8 were quantified, using the Image J software. The results of the quantitative analysis are shown as the relative values to the DMSO controls. Source data are presented in Figure 1—source data 1. (E) Immunoprecipitation analysis of cell extracts from 11 to 4 cells expressing HA-tagged ARP8. The cells were treated with DMSO, 10 μM ATMi (KU55933), or 10 μM ATRi (VE821) for 2 hr before etoposide treatment, and then the inhibitors (5 μM) were added after the cells were washed. To confirm that Ser412 is the site in ARP8 that is phosphorylated after etoposide treatment, we produced an ARP8 mutant by replacing Ser412 with alanine. An immunoprecipitation analysis revealed that the etoposide-induced phosphorylation was completely abolished by the S412A substitution, indicating that Ser412 is the sole site within ARP8 that is phosphorylated in response to etoposide treatment (Figure 1C). Next to investigate whether the etoposide-induced phosphorylation of ARP8 is regulated by ATM, we compared the phosphorylation status of ARP8 in ATM-deficient BIVA and ATM-proficient 11–4 cells after etoposide treatment. An immunoblotting analysis revealed that the etoposide-induced ARP8 phosphorylation in BIVA cells was lower than that in 11–4 cells (Figure 1D). Moreover, the phosphorylation of ARP8 in ATM-proficient 11–4 cells after etoposide treatment was repressed by the ATM-specific inhibitor, KU55933 (ATMi) (Figure 1E; lanes 1–8). These findings suggest that ATM regulates the ARP8 phosphorylation after etoposide treatment. The dose-dependent repression of the etoposide-induced ARP8 phosphorylation by ATMi in U2OS cells further supported this notion (Figure 1—figure supplement 2A). Since ATMi did not completely abolish the etoposide-induced phosphorylation of ARP8, we next examined the relevance of ATR, another PI3-family kinase member sharing the same phosphorylation motif with ATM. ATR is responsible for the phosphorylation in the DNA replication stress response, and is activated by ATM after ionizing radiation (Cuadrado et al., 2006; Jazayeri et al., 2006; Myers and Cortez, 2006). The etoposide-induced phosphorylation of ARP8 was strongly repressed by the ATR inhibitor VE821 (ATRi) in 11–4 cells (Figure 1E, lanes 9–12). 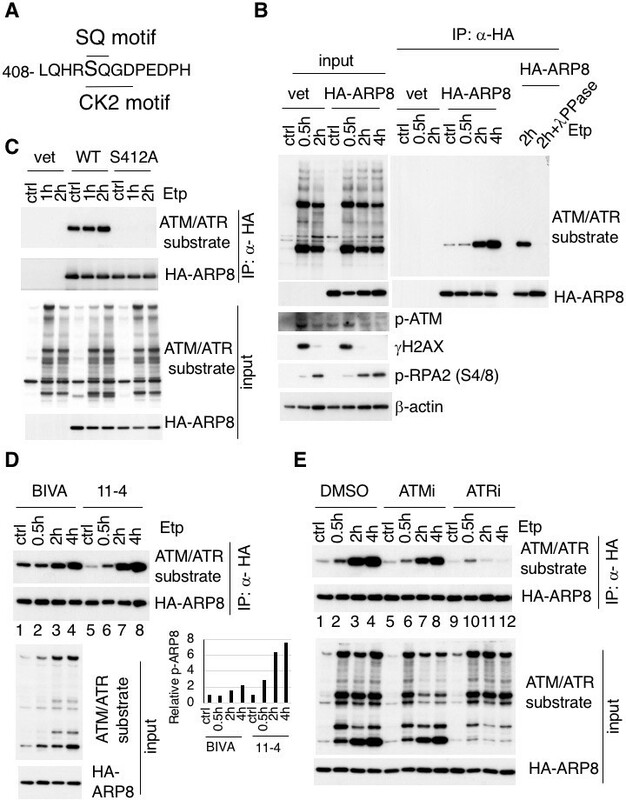 This finding suggests that ATR is the major kinase responsible for etoposide-induced ARP8 phosphorylation. In contrast, casein kinase 2, another kinase involved in the DNA damage response (Olsen et al., 2012) (Guerra et al., 2014) was not involved in the phosphorylation of ARP8 after etoposide treatment (Figure 1—figure supplement 2B). Together, these findings suggest that the phosphorylation of ARP8 at S412 after etoposide treatment is regulated by ATM and ATR. Having established that ARP8 is phosphorylated after etoposide treatment, we investigated the role of ARP8 in INO80 loading onto the MLL BCR (Figure 2A). The enrichment of γH2AX on BCR was observed in ATM-proficient 11–4 cells after etoposide treatment, suggesting that etoposide induces DNA damage specifically at the BCR (Figure 2—figure supplement 1A). A chromatin immunoprecipitation (ChIP) analysis revealed that the depletion of ARP8 reduced the binding of INO80 to the BCR after etoposide treatment in BIVA cells ((Figure 2—figure supplement 1B). Since the depletion of ARP8 did not affect the levels of INO80 (Figure 2—figure supplement 1C), the result suggests that ARP8 is required for loading INO80 onto the MLL BCR after etoposide treatment in BIVA cells. Next, to explore the role of ARP8 phosphorylation in the regulation of INO80 loading onto the BCR after etoposide treatment, we generated ATM-proficient 11–4 cell lines expressing the siRNA-resistant wild-type ARP8 (WT) or the phosphorylation-deficient mutant S412A (Figure 2—figure supplement 2A). The ChIP analysis revealed that the expression of the S412A mutant in ATM-proficient cells increased the binding of INO80 to the BCR after etoposide treatment (Figure 2B). Moreover, ATMi treatment increased the binding of INO80 to the BCR after etoposide treatment in ATM-proficient cells expressing wild-type ARP8 (Figure 2C). These findings suggest that the etoposide-induced phosphorylation of ARP8 represses the binding of INO80 to the BCR. Importantly, the ATMi treatment failed to enhance the enrichment of INO80 at the BCR in ATM-proficient 11–4 cells expressing the ARP8 S412A mutant (Figure 2D). This suggests that ARP8 phosphorylation at S412 regulated by ATM is responsible for the excessive binding of INO80 at the BCR after etoposide treatment. To further confirm the repression of the INO80 binding to the BCR by the ARP8 phosphorylation, we next introduced the siRNA-resistant phosphomimetic mutant S412D into the ATM-deficient BIVA cells. Consistently, the expression of the phosphomimetic mutant S412D in BIVA cells reduced the binding of INO80 to the BCR after etoposide treatment (Figure 2E). Taken together, these results indicate that the phosphorylation of ARP8 represses the loading of INO80 onto the MLL BCR in response to etoposide-induced damage. Phosphorylation of ARP8 negatively regulates the etoposide-induced enrichment of INO80. (A) Schematic representation of the BCR in the MLL gene. The locations of the primers used in the real-time PCR analyses are shown. The arrow indicates 11q23 chromosome translocation breakpoint hotspot identified in treatment-related leukemia. Ex: Exon. (B) ChIP analysis of the INO80 loading onto the MLL BCR in endogenous ARP8-depleted11-4 Flp-In cells expressing either the siRNA-resistant wild-type (WT) or phospho-deficient ARP8 (S412A) after tetracycline treatment. The cells were treated with DMSO (ctrl) or etoposide for 15 min, washed, and then cultured in fresh medium for 1 or 2 hr. GAPDH is shown as the control region. Values represent the means ± SE from three independent experiments. *: p<0.05. Source data are presented in Figure 2—source data 1. (C) ChIP analysis of the INO80 loading onto the MLL BCR in wild-type ARP8 expressing11-4 Flp-In cells. The cells were treated with/without an ATM inhibitor (KU55933) for 2 hr before etoposide treatment, and then the inhibitors (5 μM) were added after the cells were washed. The experiment was performed as described in (B). Values represent the means ± SE from three independent experiments. *: p<0.05. The level of ATM phosphorylation or expression of INO80 was shown in Figure 2—figure supplement 2B. Source data are presented in Figure 2—source data 1. (D) ChIP analysis of the INO80 loading onto the MLL BCR in S412A ARP8 expressing 11–4 Flp-In cells. The cells were treated with/without 10 μM ATM inhibitor for 2 hr before etoposide treatment, and then the inhibitors (5 μM) were added after the cells were washed. The experiment was performed as described in (B). Values represent the means ± SE from three independent experiments. n.s: no significant difference. The levels of ATM phosphorylation and INO80 expression are shown in Figure 2—figure supplement 2C. Source data are presented in Figure 2—source data 1. (E) ChIP analysis of the INO80 loading onto the MLL BCR in endogenous ARP8-depleted BIVA cells transfected with either the siRNA-resistant wild-type (WT) or phospho-mimetic ARP8(S412D). The control cells were transfected with an empty vector and a non-targeting siRNA (vet). The cells were treated with DMSO (ctrl) or etoposide for 15 min, washed, and then cultured in fresh medium for 1 hr. Values represent the means ± SE from three independent experiments. *p<0.05, n.a: not analyzed. Source data are presented in Figure 2—source data 1. To determine whether the phosphorylation of ARP8 affects the loading of INO80 onto the MLL BCR through its interaction with INO80, we performed an immunoprecipitation analysis using U2OS cells. We found that etoposide treatment increased the interaction between INO80 and ARP8 in the ATM-proficient U2OS cells (Figure 3A). The etoposide-induced interaction between INO80 and ARP8 was enhanced by the treatment of U2OS cells with an ATM inhibitor (Figure 3A). These findings raised the possibility that ATM negatively regulates the interaction of ARP8 with INO80 after etoposide treatment. Therefore, we investigated the role of the ATM-regulated phosphorylation of ARP8 in the interaction between ARP8 and INO80 after etoposide treatment by using the U2OS cells stably expressing the phosphorylation-deficient ARP8 S412A mutant. An immunoprecipitation analysis showed an increased level of interaction of the ARP8 S412A mutant with INO80 after etoposide treatment, as compared to that of wild-type ARP8 (ARP8 WT) in ATM-proficient cells (Figure 3B). Similar results were obtained using the U2OS cells transiently expressing the ARP8 S412A mutant (Figure 3—figure supplement 1A). These findings support the notion that the phosphorylation of ARP8 represses its interaction with INO80 after etoposide treatment. To confirm the repression of the association of ARP8 with INO80 by ATM, we transiently expressed HA-tagged ARP8 WT or S412D mutant in ATM-deficient BIVA cells. An immunoprecipitation analysis revealed the increased interaction of INO80 with ARP8 WT, but not with the S412D mutant, in ATM-deficient BIVA cells after etoposide treatment (Figure 3—figure supplement 1B). A proximity ligation assay confirmed the decreased interaction of INO80 with the ARP8 S412D mutant (Figure 3—figure supplement 2). Taken together, these findings suggest that the phosphorylation of ARP8 represses the interaction between INO80 and ARP8 after etoposide treatment. ARP8 phosphorylation deficiency increased its interaction with INO80. (A) Immunoprecipitation analysis of the interaction between INO80 and ARP8 in ATM inhibitor treated U2OS cells. The cells were treated with 10 μM KU55933 (ATMi) or equal amounts of DMSO (mock) for 2 hr, and then treated with DMSO (ctrl) or etoposide for 15 min, washed, and then cultured in fresh medium with or without 5 μM KU55933 for 2 hr. Immunoprecipitation analysis was performed with either anti-ARP8 antibodies or normal IgG. The relative immunoprecipitated amounts of INO80 are shown. Quantitative analysis was performed using the Image J software. (B) Examination of the interaction between INO80 and ARP8 in U2OS cells expressing HA-tagged wild-type or S412A ARP8. The endogenous ARP8-depleted cells were treated with etoposide for 15 min. After the cells were washed, they were placed in fresh medium and harvested at the indicated time points. The nuclear extracts were incubated with anti-HA-conjugated anti-mouse IgG Dynabeads. The precipitates were electrophoresed through a gel and probed by western blotting with an anti-INO80 or an anti-HA or an anti-ATM/ATR substrate antibody. The amounts of INO80 and HA-ARP8 were quantified, using the Image J software. The results of quantitative analysis are shown as the relative values as compared to the DMSO control from three independent experiments. Source data are presented in Figure 3—source data 1. In our previous study, we detected the excess loading of RAD51 onto the BCR of the MLL gene in etoposide-treated ATM-deficient BIVA cells (Sun et al., 2010). In yeast, INO80 promotes DNA end resection and RAD51 binding to ssDNA for homology search/invasion during HR (Lademann et al., 2017; Tsukuda et al., 2009). To explore the mechanism of excessive RAD51 loading on the BCR, we examined the involvement of INO80 in RAD51 binding to damaged chromatin. A ChIP assay revealed that the depletion of INO80 by siRNA reduced the loading of RAD51 onto the MLL BCR in BIVA cells after etoposide treatment, suggesting that human INO80 promotes RAD51 binding to the BCR (Figure 4—figure supplement 1A and B). We next investigated the requirement for ARP8 in RAD51 binding to the MLL BCR. A ChIP analysis showed that the depletion of ARP8 reduced the binding of RAD51 to the MLL BCR in BIVA cells after etoposide treatment (Figure 4—figure supplement 1C). Since the depletion of ARP8 did not affect the level of RAD51 (Figure 2—figure supplement 1C), these findings suggest the involvement of ARP8 in the excessive binding of RAD51 to the BCR in BIVA cells. We then studied the effect of ARP8 phosphorylation on the regulation of RAD51 binding to the BCR after etoposide treatment. The expression of the ARP8 phosphorylation-deficient mutant S412A increased the RAD51 binding to the BCR of the MLL gene after etoposide treatment in ATM-proficient cells (Figure 4A). In ATM-proficient cells, ATMi treatment resulted in an increase of RAD51 binding to the BCR (Figure 4B), but it did not cause a further increase of RAD51 when ARP8 S412A was expressed (Figure 4C). In contrast, the expression of the ARP8 phosphomimetic mutant S412D in ATM-deficient BIVA cells repressed the excessive binding of RAD51 to the BCR (Figure 4D). These results strongly suggest that ARP8 phosphorylation at S412 represses the loading of RAD51 onto the MLL BCR after etoposide treatment. Taken together, the phosphorylation of ARP8 regulated by ATM may negatively regulate the loading of RAD51 onto the BCR after etoposide treatment, by repressing the loading of the INO80 complex. ARP8 phosphorylation prevents the excessive RAD51 loading onto MLL BCR. (A) ChIP analysis of the RAD51 loading onto the MLL BCR in endogenous ARP8-depleted11-4 Flp-In cells expressing the siRNA-resistant wild-type (WT) or phospho-deficient ARP8 (S412A) after tetracycline treatment. The cells were treated with DMSO (ctrl) or etoposide for 15 min, washed, and then cultured in fresh medium for 1 or 2 hr. Values represent the means ± SE from three independent experiments. **: p<0.01. Source data are presented in Figure 4—source data 1. (B) ChIP analysis of the RAD51 loading onto the MLL BCR in wild-type ARP8 expressing 11–4 cells. Following a treatment with/without 10 μM ATM inhibitor (KU55933) for 2 hr, the cells were treated with DMSO (ctrl) or etoposide for 15 min, washed, and then cultured in fresh medium with or without 5 μM KU55933 for 1 or 2 hr. Values represent the means ± SE from three independent experiments. *p<0.05. The levels of ATM phosphorylation and expression of RAD51 are shown in Figure 2—figure supplement 2B. Source data are presented in Figure 4—source data 1. (C) ChIP analysis of the RAD51 loading onto the MLL BCR in S412A ARP8 mutant expressing 11–4 Flp-In cells. The experiment was performed as described in (B). Values represent the means ± SE from three independent experiments. n.s: no significant difference. The levels of ATM phosphorylation and RAD51 expression are shown in Figure 2—figure supplement 2C. Source data are presented in Figure 4—source data 1. (D) ChIP analysis of the RAD51 loading onto the MLL BCR in endogenous ARP8-depleted BIVA cells transfected with either the siRNA-resistant wild-type (WT) or phospho-mimetic ARP8 (S412D). GAPDH is shown as the control region. The control cells were transfected with the empty vector and the non-targeting siRNA (vet). Values represent the means ± SE from three independent experiments. *p<0.05. n.a: not analyzed. Source data are presented in Figure 4—source data 1. Having established that ARP8 regulates the loading of RAD51 and INO80 onto the BCR after etoposide treatment, we decided to examine the involvement of ARP8 in 11q23 chromosome translocations. A two-color fluorescence in situ hybridization (FISH) analysis, covering the upstream and downstream regions of the MLL BCR, revealed that the number of BIVA cells carrying split FISH signals after etoposide treatment was significantly reduced by the siRNA-mediated depletion of ARP8, suggesting the involvement of ARP8 in 11q23 chromosomal abnormalities in ATM-deficient cells (Figure 5A and B). This finding was confirmed by the FISH analysis with a different DNA probe set (Figure 5—figure supplement 1A). In contrast, the number of split signal positive cells among the ATM-proficient 11–4 cells was increased by the depletion of ARP8 (Figure 5B). This was confirmed by the FISH analysis of ARP8-deficient Nalm-6 cells (Figure 5—figure supplement 1B). These findings suggest that ATM prevents the etoposide-induced 11q23 chromosome translocations through the regulation of ARP8. ARP8 phosphorylation averts 11q23 chromosome translocations. (A) Dual-color FISH analysis of chromosome 11q23. Representative FISH images using etoposide treated BIVA cells are shown. Arrows indicate the split signals (separated by >1 µm). Scale bar: 5 μm. (B) The percentages of AT5BIVA or 11–4 cells with split chromosome 11q23 signals are shown. The non-targeting control siRNA (siNT) or siARP8-depleted cells were treated with DMSO (ctrl) or etoposide for 15 min, washed, and cultured for 6 hr in fresh medium. At least 2,000 cells were analyzed in every experiment. The average percentages of cells with split signals from four independent experiments are shown. Values represent the means ± SE. ***p<0.001 as determined by the Z test. The ARP8 knockdown is shown in the gel image on the right. Source data are presented in Figure 5—source data 1. (C, D) Dual-color FISH analyses of chromosome 11q23 using ARP8-depleted AT5BIVA (C) and 11–4 (D) cells expressing the siARP8-resistant ARP8 wild-type (WT), S412D, or S412A. The average percentages of the cells with split signals from three independent experiments are shown. Values represent the means ± SE. ***p<0.001 as determined by the Z test. Source data are presented in Figure 5—source data 1. (E) Dual-color FISH analyses of chromosome 11q23 using 11–4 cells expressing the siARP8-resistant ARP8 S412A. The cells were treated with/without 10 μM ATM inhibitor (KU55933) for 2 hr before etoposide treatment. After the cells were washed, KU55933 (5 μM) was added until the cells were harvested. The average percentages of the cells with split signals from three independent experiments are shown. Values represent the means ± SE from three independent experiments. n.s. : no significant difference. Source data are presented in Figure 5—source data 1. Next, to investigate the role of the ATM-dependent phosphorylation of ARP8 in preventing the 11q23 chromosome abnormalities, we performed the FISH analysis of ATM-deficient BIVA cells expressing the phospho-mimicking ARP8 S412D mutant. The FISH analysis revealed that the expression of ARP8 S412D reduced the number of cells exhibiting split FISH signals after etoposide treatment in ATM-deficient cells (Figure 5C). In contrast, the expression of the phospho-deficient ARP8 S412A mutant increased the incidence of 11q23 chromosome translocations in ATM-proficient 11–4 cells (Figure 5D). Notably, ATMi treatment failed to enhance the event in ARP8 S412A mutant expressing cells (Figure 5E). 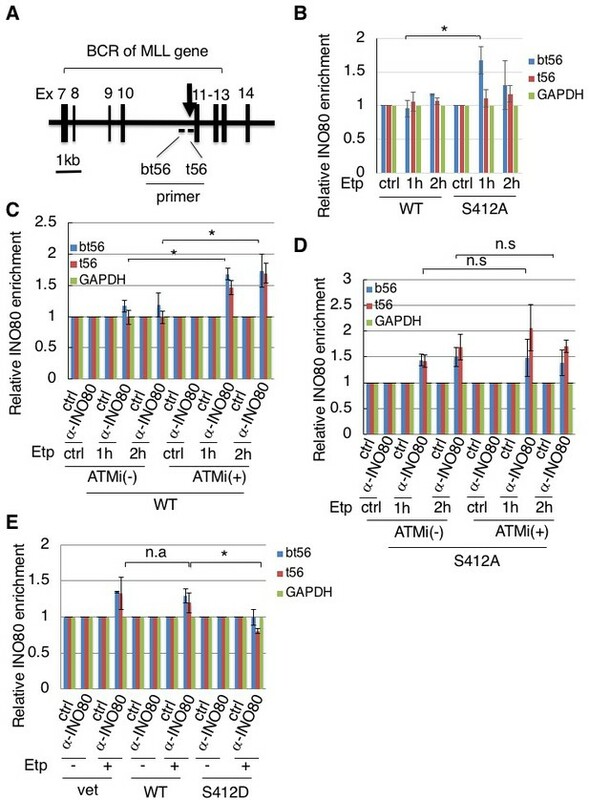 Taken together, these findings strongly suggest that the ATM-dependent phosphorylation of ARP8 is required to prevent the etoposide-induced 11q23 chromosome abnormalities, through the negative regulation of RAD51 and INO80 binding to the BCR. Since the etoposide-induced phosphorylation of ARP8 was strongly repressed by an ATR inhibitor in 11–4 cells (Figure 1E), the ATR-dependent phosphorylation of ARP8 could also be involved in the excessive RAD51 loading onto the BCR. To test this possibility, we performed a chromatin immunoprecipitation assay of 11–4 cells treated with the ATR inhibitor, VE821. In contrast to the significant increase of etoposide-induced RAD51 binding to the BCR by the treatment with the ATM inhibitor, ATR inhibition failed to so (Figure 6A). These results suggest that ATR is not involved in the regulation of RAD51 binding at the BCR of MLL after etoposide treatment. ATM, but not ATR, negatively regulates RAD51 loading onto the BCR after etoposide treatment to repress 11q23 chromosome translocations. (A) ChIP analysis of the RAD51 loading onto the MLL BCR in ATMi or ATRi or a combination of ATMi and ATRi treated 11–4 cells. 11–4 cells were treated with ATMi (10 µM), ATRi (10 µM), or a combination of ATMi and ATRi for 2 hr before etoposide treatment. After washing the cells, the inhibitors (5 μM) were added until the cells were harvested. The ChIP analysis was performed as described in Figure 4. Values represent the means ± SE from three independent experiments. *p<0.05. **p<0.01. Source data are presented in Figure 6—source data 1. (B) The percentages of 11–4 cells with split chromosome 11q23 signals are shown. 11–4 cells were treated with ATMi (10 µM), ATRi (10 µM), or a combination of ATMi and ATRi for 2 hr before etoposide treatment. After the cells were washed, the inhibitors (5 μM) were added until the cells were harvested. Dual-color FISH analyses of chromosome 11q23 were performed as described in Figure 5. Values represent the means ± SE from three independent experiments. *p<0.05. **p<0.01, ***p<0.001, n.s. : no significant difference. Next, we examined the effect of an ATRi on the etoposide-induced 11q23 chromosome translocations in ATM-proficient 11–4 cells, by the dual color FISH analysis using the MLL gene probes (Figure 6B). The increase of the split signal positive cells by ATRi was less than that by ATMi. Although ATR is suggested to be the major kinase responsible for ARP8 phosphorylation after etoposide treatment, this finding suggests that the effect of ATRi on the etoposide-induced chromosome translocations is limited. Moreover, no additional effects of ATRi on the increase of the chromosome translocations by ATMi were observed. Taken together, these findings strongly suggest that ATM, but not ATR, negatively regulates RAD51 loading onto the BCR after etoposide treatment to repress11q23 chromosome translocations. Our present results are the first to identify ARP8 as the phosphorylation target regulated by ATM and ATR after the induction of DNA damage by etoposide treatment. ARP8 facilitates the binding of INO80 and RAD51 to the BCR of the MLL gene, while the phosphorylation of ARP8 suppresses it through a reduction of its interaction with INO80. The incidence of etoposide-induced 11q23 translocations is reduced by the expression of the phospho-mimicking ARP8 mutant in ATM-deficient cells. Moreover, the expression of the phospho-deficient ARP8 in ATM-proficient cells increases chromosome translocations. ATR was not involved in the regulation of RAD51 binding to the BCR after etoposide treatment. These findings strongly suggest that ATM represses the 11q23 chromosome translocations by regulating the binding of INO80 and RAD51 to the BCR of the MLL gene at functionally appropriate levels, via the phosphorylation of ARP8. In response to DNA damage, the DNA repair process is facilitated by the phosphorylation of various proteins, including DNA repair factors, cell cycle regulators, and chromatin remodeling factors, through the positive regulation by ATM and ATR (Maréchal and Zou, 2013) (Cimprich and Cortez, 2008) (Clouaire et al., 2017; Shiloh, 2003; Shiloh and Ziv, 2013). In contrast, Exo1, an exonuclease for end resection in HR, is also phosphorylated by ATM in response to DNA damage, but to inhibit its exonuclease activity for the prevention of the untimely generation of ssDNA for RAD51 loading (Bolderson et al., 2010). In this study, we show that the phosphorylation of ARP8 represses the binding of INO80 and RAD51 to damaged chromatin (Figures 2 and 4). 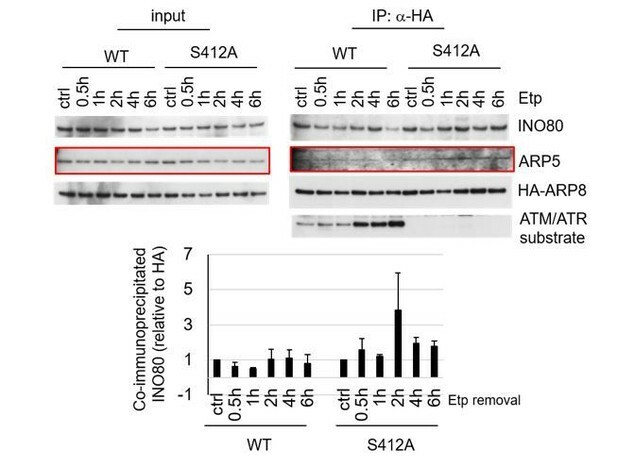 Importantly, the phosphorylation of ARP8 reduced its interaction with INO80 (Figure 3, Figure 3—figure supplements 1 and 2). Since ARP8 is required for the binding of the INO80 complex to damaged chromatin (Kashiwaba et al., 2010; Saravanan et al., 2012), the reduced interaction of ARP8 with INO80 by its phosphorylation may repress the binding of INO80 to the damaged chromatin and thus reduce ssDNA formation and RAD51 loading around damaged sites. ARP8 phosphorylation is significant from 2 hr after etoposide treatment, which is slower than the phosphorylation of ATM and H2AX. Therefore, it may also facilitate the dissociation of INO80 from damaged chromatin after the appropriate remodeling of damaged chromatin for DNA repair to avoid illegitimate recombination, leading to chromosome abnormalities. The phosphorylation of various proteins regulated by ATM may play an important role to prevent chromosome abnormalities, by maintaining the recombination activity within an appropriate range through both positive and negative regulation of repair proteins. The phosphorylation of ARP8 is relatively slow, and occurs more than 2 hr after etoposide treatment, as compared to the early activation of ATM within 1 hr (Bakkenist and Kastan, 2003; Tanaka et al., 2007). Since the recombinational repair of DSBs starts slowly as compared to the end-joining repair, which normally begins within 30 min (Mao et al., 2008), this is consistent with the notion that ARP8 plays an important role in the appropriate regulation of the recombinational repair proteins. The slower phosphorylation of ARP8 also suggests the involvement of kinases other than ATM. Indeed, we found that ATR also regulates the etoposide-induced phosphorylation of ARP8. Moreover, ATRi repressed the phosphorylation of ARP8 especially from 2 hr after the etoposide treatment. These findings suggest the presence of different regulation systems of ARP8 phosphorylation after the induction of DNA damage. The phosphorylation of ARP8 after etoposide treatment could be regulated by multiple steps and factors for the precise control of DNA repair activity to maintain chromosome stability. This study revealed that ATR is likely to be the major kinase responsible for the etoposide-induced ARP8 phosphorylation. However, unlike the inhibition of ATM, ATR inhibition failed to increase the RAD51 binding to the BCR of MLL after etoposide treatment (Figure 6), suggesting that ATR is not involved in the regulation of RAD51 binding to the BCR after etoposide treatment. Although the mechanism of 11q23 chromosome translocations is still unclear, a specific DNA sequence and/or chromatin structure of the BCR has been suggested to promote the mis-rearrangement of this region during the repair process (Gole and Wiesmüller, 2015). Therefore, ARP8 phosphorylation by ATM functions in the prevention of chromosome translocation at the BCR, while that by ATR may play roles in the repair of different types of DNA damage not relevant to chromosome translocations. Further studies are required to clarify the distinct roles of ATM and ATR in the phosphorylation of ARP8 after the induction of DNA damage, to coordinate the HR activity for accurate DNA repair. Several lines of evidence have suggested the association of HR with genomic instability (Bishop and Schiestl, 2003; Guirouilh-Barbat et al., 2014; Mizuno et al., 2009; Reliene et al., 2007; Ruiz et al., 2009). RAD51-deficient vertebrate cells accumulate chromosomal breaks, resulting in an early embryonic lethal phenotype (Lim and Hasty, 1996; Sonoda et al., 1998). However, the overexpression of human RAD51 also leads to genomic instability (Kim et al., 2001; Marsden et al., 2016; Reliene et al., 2007; Richardson et al., 2004). These findings suggest that both the down- and up-regulation of the recombination activities through the levels of the RAD51 protein are associated with chromosomal instability. Together with the regulation of the RAD51 function at the protein level, the regulation of the BCR binding by the ATM-regulated phosphorylation of ARP8 may play an important role in maintaining the local recombination activities within an appropriate range, to ensure the fidelity of DNA repair and prevent chromosome translocations. INO80 and ARP8 have been shown to regulate the RAD51 loading to damaged chromatin in yeast (Tsukuda et al., 2005) (Tsukuda et al., 2009) (van Attikum et al., 2007) (Lademann et al., 2017). Moreover, the overexpression of human RAD51 leads to the various types of chromosome abnormalities (Reliene et al., 2007; Richardson et al., 2004). Therefore, this regulation of HR by ARP8 in human cells may also be applicable to DSBs in general. The wild-type and the phospho-deficient mutant of ARP8 show increased interactions with INO80 after etoposide treatment, but the phospho-mimetic mutant does not (Figure 3, and Figure 3—figure supplements 1 and 2). Human ARP8 contains five insertions in the conserved actin fold domain (Gerhold et al., 2012) (Figure 1—figure supplement 1B). The S412 residue is located in a major loop insertion (insertion IV, residues 401–507) (Figure 1—figure supplement 1C). This region lacks interpretable electron density, suggesting its high flexibility to mediate dynamic protein–protein interactions (Gerhold et al., 2012). Moreover, the involvement of insertion IV in forming a proper ARP8-DNA complex has been suggested (Osakabe et al., 2014). Therefore, the phosphorylation of S412 within insertion IV of ARP8 could affect the binding activity of the INO80 complex to damaged chromatin, by suppressing the interactions with INO80 and components of damaged chromatin. Interestingly, ARP8 is conserved from yeast to human, but the 412-SQ motif is conserved only in higher eukaryotes, and not in yeast, Drosophila and Xenopus (Figure 1—figure supplement 1D). Although the mechanism by which the ARP8 phosphorylation regulates the activity of the INO80 complex remains to be clarified, the DNA damage-dependent ARP8 phosphorylation may have evolutionary advantages in DNA repair. Chromosome abnormalities involving the MLL gene are one of the most frequent chromosomal aberrations observed in secondary leukemia associated with cancer therapy. We have shown that the etoposide-induced DNA damage in ATM-deficient cells facilitates the illegitimate recombination at the MLL gene, through the excessive binding of RAD51 and INO80 to the BCR. Our findings highlight the importance of the ATM-dependent modulation of recombination repair to avert 11q23 chromosome translocations. Further studies to investigate the mechanism that maintains the fidelity of DNA repair activity, using the chromosome translocations observed in secondary malignancy will provide new insights into the general mechanisms of carcinogenesis. The SV40-transformed AT fibroblast cell line AT5BIVA and its ATM-proficient derivative, AT5BIVA cells reconstituted with chromosome 11 (11-4), were kindly provided by Dr. S. Matsuura (Sun et al., 2010). The AT5BIVA cells were cultured in Dulbecco’s Modified Eagle’s medium (DMEM, Sigma-Aldrich), supplemented with 10% fetal bovine serum (FBS, Equitech-Bio, Kerrville, USA). The 11–4 cells were maintained in DMEM supplemented with 10% FBS and 0.2 mg/ml of G418 (Nacalai Tesque). The Flp-In T-Rex 11–4 cells were maintained in DMEM, supplemented with 10% tetracycline-free FBS (Sigma-Aldrich, St. Louis, USA), 10 μg/ml blasticidin S HCl (Gibco, Japan) and 40 μg/ml hygromycin B (Invitrogen, Carlsbad, USA). The human osteosarcoma U2OS cell line (ATCC) was cultured in Minimum Essential Medium Eagle (MEM, Sigma-Aldrich), supplemented with 10% FBS. GM0637 cells were cultured in DMEM, supplemented with 10% FBS. Tet-Off ARP8 Nalm-6 cells were cultured at 37°C in RPMI-1640, containing GlutaMAX-I (Gibco) and supplemented with 10% FBS. For the induction of the ARP8 knockout, tetracycline (Sigma-Aldrich) was added to the culture medium to a final concentration of 2 μg/ml (Osakabe et al., 2014). AT5BIVA, 11–4 cell lines were kindly provided by Dr. S. Matsuura laboratory, Hiroshima University, Japan. U2OS cell line was purchased from ATCC. GM0637 cell line was kindly provided by Dr. T. Cremer laboratory, LMU, Germany. Tet-Off ARP8 Nalm-6 cell line was kindly provided by Dr. M. Harata laboratory, Tohoku University, Japan. For the induction of DNA damage, as described elsewhere, the cells were exposed to 100 μM etoposide (Sigma-Aldrich), unless otherwise stated, for 15 min, washed, and cultured in fresh medium. Dimethylsulfoxide (DMSO) was used as the vehicle for etoposide, and was present in the cell cultures at a final concentration of 0.1%. Unless otherwise stated, both the ATM inhibitor KU55933 (Merck Millipore, Billerica, USA) and ATR inhibitor IV VE821 (Merck Millipore) were used at 10 μM for two hours before etoposide treatment and at 5 μM after the cells were washed, respectively. The antibodies used for chromatin immunoprecipitation, immunoblotting, and immunofluorescence staining were rabbit anti-phospho ATM/ATR substrate motif (Cell Signaling Technology, Danvers, USA), mouse anti-phospho ATM (Rockland, Pottstown, USA), mouse anti-HA, mouse anti-γH2AX (Merck Millipore), rabbit anti-RAD51 (Bio Academia,Japan), rabbit anti -RPA2 S4/8 and rabbit anti-INO80 (Bethyl, Montgomery, USA), mouse anti-RPA34 (Lab Vision, Fremont, USA), rabbit anti-glyceraldehyde-3-phosphate dehydrogenase (anti-GAPDH) (Santa Cruz Biotechnology, USA), rabbit anti-H2AX (Abcam, UK), and mouse anti-β-actin (Sigma-Aldrich) and rabbit anti-ARP8 (Osakabe et al., 2014). All siRNAs were Ambion Silencer Select siRNAs (Thermo Fisher Scientific,USA). The siRNAs were s41201 for ARP8, s57219 for ATM, s3638 for CK2, s29257 and s224310 for INO80. Select Negative Control siRNA was used as the control. The siRNA interference experiments were performed 2 days after transfection with 0.2–0.3 nM siRNA, using Lipofectamine RNAiMAX (Invitrogen). The pcDNA 3.1 vector bearing the HA-tagged ARP8 was constructed by inserting the PCR-amplified ARP8 cDNA into the NotI/HindIII sites, followed by inserting the PCR-amplified HA between the ApaI and XhoI sites of pcDNA3.1/Myc-His (-) C. Plasmid transfections were performed using the GeneJuice transfection reagent (Novagen, Billerica, USA), according to the manufacturer’s instructions. For rescue experiments, the siRNA-resistant ARP8 expression vector was co-transfected with the siRNA, using the Lipofectamine 2000 transfection reagent (Invitrogen) for 2 or 3 days. The mutant vectors were constructed by site-directed mutagenesis, using the indicated oligonucleotides: For the siRNA-resistant HA-ARP8 mutant, 5'-ctcaacaaaatgccaccatcgttcagacgtataattgaaaatgtggatg-3', for the HA-ARP8 S418A mutant, 5'-TTGCAGCACAGAGCTCAGGGCGATCCTG-3', and for the S418D mutant, 5'-TTGCAGCACAGAGATCAGGGCGATCCTG-3'. The sequences were confirmed using a BigDye Terminator v3.1 Cycle Sequencing Kit and an Applied Biosystems Genetic Analyzer, model 3130. To generate cells stably expressing U2OS, the pcDNA 3.1 plasmid encoding the HA-tagged wild-type or S412A mutant of ARP8 was transfected using the GeneJuice transfection reagent, with G418 selection (Nacalai Tesque, Japan). After the confirmation of stable expression by immunofluorescence staining and immunoblotting, pools of single clones were used for experiments. For the generation of the inducible expression of wild-type or phosphorylation mutant ARP8 in 11–4 cells, the Flp-In System (Thermo Fisher Scientific) was used, according to the manufacturer’s instructions. The siRNA-resistant HA-tagged wild-type,or S412A ARP8 fragment from pcDNA 3.1 HA-ARP8 was inserted between the HindIII and KpnI sites of the pcDNA5/FRT/TO vector. For the induction of the HA-ARP8 expression, a final concentration of 2 μg/ml tetracycline was added for 24 hr. FISH analyses were performed using the 11q23 chromosome translocation probe (XL MLL plus, MetaSystems probes, Germany) and the LSI MLL Dual Color, BreakApart Rearrangement Probe (Vysis, Abbott Molecular Inc. Abbott park, USA), according to the manufacturers’ protocols. For the DNA FISH analysis using the probe from Metaystems, the images were acquired on an Axio Imager Z2 microscope (Carl Zeiss, Germany) equipped with the MetaSystems software. Subsequently, at least 2000 etoposide-exposed or DMSO-exposed cells were counted by the Metafer platform, MetaCyte, and the cells containing split signals (separated by >1 μm) were monitored. For the DNA FISH analysis using the probe from Vysis, the images were acquired on a Zeiss AxioplanII microscope using an AxioCamMRm controlled by Axiovision. At least 200 etoposide-exposed or DMSO-exposed cells were counted. All FISH analyses were repeated three times. After fixation in 4% paraformaldehyde in 1X phosphate-buffered saline (PBS) for 10 min at room temperature, the cells were permeabilized with 0.1% sodium dodecyl sulfate (SDS)−0.5% Triton X-100 in 1x PBS for 5 min. For the detection of HA-tagged ARP8, fixed cells were incubated for 30 min at 37°C with a mouse anti-HA antibody (1:600) in 1% bovine serum albumin (BSA)/1 XPBS. Cy3-conjugated goat anti-mouse (1:1,000, Invitrogen) antibodies were used as the secondary antibodies. Cells were mounted using Vectashield containing DAPI and observed with a BZ-X700 microscope (Keyence). The nuclear fraction was prepared as described previously (Liu et al., 2015). The whole cells extracts were prepared using buffer C (20 mM HEPES pH 7.9, 400 mM NaCl, 1 mM EDTA, 0.1% NP-40, 0.5 mM DTT, 1X protease inhibitor (Roche), 1X phosphatase inhibitor (Nacalai Tesque), 20% glycerol), and the diluted lysates were used for immunoprecipitation. For immunoprecipitation assay of transfected cells, anti-HA antibody conjugated IgG Dynabeads (Novex) were used, and for the endogenous protein, anti-INO80 antibody, anti-ARP8 antibody, or normal IgG conjugated IgG Dynabeads were used. The immunoprecipitation analysis was performed at least twice to confirm the results. The precipitates were electrophoresed through a gel and probed by western blotting with the indicated the antibodies. The intensities of the bands were quantified, using the Image J software. GM0637 cells were transfected with the HA-tagged wild type or S412A or S412D mutant of ARP8 or empty vector for 24 hr, fixed with 2% paraformaldehyde in PBS for 10 min at room temperature and permeabilized with 0.5% Triton X-100 in PBS for 5 min at room temperature. The cells were incubated with the rabbit anti-INO80 and mouse anti-HA antibodies diluted in 0.1% BSA for 30 min at 37°C in a moist chamber. Proximity ligation was then conducted in situ, according to the manufacturer’s instructions (Olink Bioscience, Sweden). We used the PLA probe anti-rabbit PLUS and the PLA probe anti-mouse MINUS. To visualize the interaction between two proteins, the samples were incubated for ligation and amplification. After serial SSC (sodium/sodium citrate) washes, nuclei were stained with DAPI. The slides were mounted with Vectashield (Vector Labs). PLA signals were detected with an LSM780 confocal microscope (Carl Zeiss), with a 63 × 1.40 NA plan-apochromat objective, and counted in at least 400 cells with the Image J software. All PLA analyses were repeated four times. Data in all experiments are represented as mean ± SE. Statistical analysis was performed using the two-tailed unpaired t- test. For the FISH analysis, the percentages of cells with split signals were determined by the Z test of homogeneity for independent samples. Results reaching p<0.05 were considered to be statistically significant (*p<0.05, **p<0.01, ***p<0.001). Experimental and Molecular Pathology 74:94–105. The Journal of Biological Chemistry 286:11283–11289. Nature Reviews Molecular Cell Biology 9:616–627. The Journal of Experimental Medicine 203:297–303. Frontiers in Cell and Developmental Biology 3:41. Molecular and Cellular Biology 31:4735–4745. Is homologous recombination really an error-free process? Journal of Biological Chemistry 280:41207–41212. Biochemical and Biophysical Research Communications 402:619–625. JNCI Journal of the National Cancer Institute 92:795–802. Journal of Biological Chemistry 274:37538–37543. Molecular and Cellular Biology 16:7133–7143. Cold Spring Harbor Perspectives in Biology 5:a012716. Journal of Biological Chemistry 281:9346–9350. Journal of Clinical Investigation 116:80–89. Journal of Biological Chemistry 275:22719–22727. Molecular and Cellular Biology 29:5441–5454. Molecular and Cellular Biology 26:5406–5420. Nature Reviews Molecular Cell Biology 14:197–210. Thank you for submitting your article "ATM phosphorylates ARP8 to prevent chromosome translocations by counteracting repair protein loading to damaged sites" for consideration by eLife. Your article has been reviewed by three peer reviewers, and the evaluation has been overseen by Jerry Workman as the Reviewing Editor and Jessica Tyler as the Senior Editor. The reviewers have opted to remain anonymous. In this manuscript, the authors addressed the phosphorylation of ARP8, a subunit of INO80-C, upon etoposide treatment, and how this phosphorylation affects the MLL translocation, which occurs frequently in leukemia. The authors established that ATM regulates phosphorylation of ARP8 S412 after etoposide treatment by an anti-ATM/ATR substrate antibody. Arp8 phosphorylation detected by this antibody was sensitive to the phosphatase treatment and it was abolished upon mutation of ARP8 S412 to alanine, suggesting that S412 is the only phosphorylation site detectable in ARP8. They further showed that S412 phosphorylation is sensitive to treatment with the ATM inhibitor KU55933 and to knockdown of ATM siRNA, suggesting that ATM regulates S412 phosphorylation. To explore the molecular role of ARP8 S412 phosphorylation, the authors first tested its influence on INO80-ARP8 protein interaction upon etoposide treatment. They found that ATM inhibition or ARP8 alanine mutation at S412 of ARP8 enhanced INO80-ARP8 interaction. These findings indicate that ATM dependent phosphorylation on ARP8-S412 reduces ARP8 INO80 interaction. To elucidate consequences of changed ARP8 INO80 interaction, the authors investigated the binding of INO80 and a HR protein RAD51 to a chromosome breakpoint clustered in BCR MLL locus that is associated with chromosome translocation. They demonstrated by ChIP analyses that increased INO80 and RAD51 association to the break point upon etoposide treatment is sensitive to ARP8 silencing and phospho-mimetic S412D ARP8 mutation in ATM deficient BIVA cells. 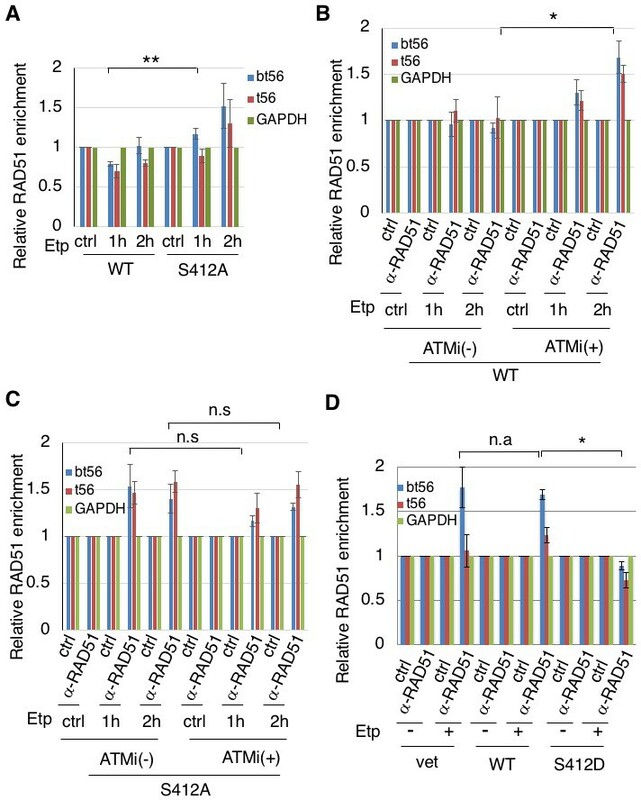 Conversely, they showed that an ARP8 S412A non-phospho mutation increases INO80 and RAD51 binding to the break point in ATM-proficient cells. 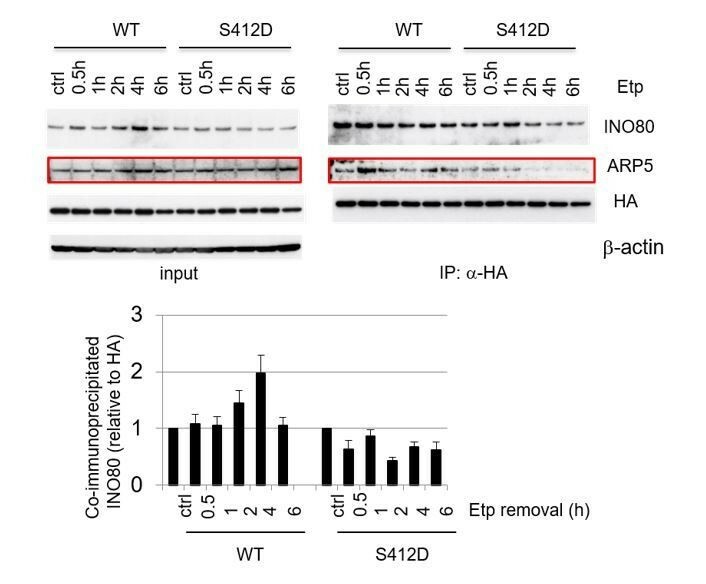 These results suggest that the phosphorylation of ARP8 S412, which minimizes the INO80 interaction, reduces INO80 and RAD51 association to the break point. The authors further tested the ARP8 mutants on translocation. They showed by FISH analysis that 11q23 chromosome translocations after etoposide treatment in ATM-deficient cells (BIVA) are significantly reduced upon siRNA-mediated knockdown of ARP8, whereas translocations are increased in ATM-proficient cells (11-4). Expression of the ARP8 S412A or D mutant affects the number of chromosome translocations in an opposite manner, consistent with the notion that the ARP8 S412 phosphorylation reduces translocation events. Overall, the data presented in the manuscript support a model that ARP8 phosphorylation mediated by ATM suppresses 11q23 translocation by reducing the binding of the INO80 and RAD51 HR protein to the break site. However, authors did not provide any evidence that ATM directly targets ARP8, nor ATM and ARP8 function in the same pathway. 1) In the current manuscript, we did not find data that shows direct phosphorylation of ARP8 S412 by ATM, as the title of this manuscript indicates. The antibody probes for ATM or ATR targets and ATM inhibition only partially inhibits ARP8 phosphorylation detected by the antibody. Furthermore, ARP8 S412 phosphorylation status in ATM deficient BIVA cells compared to the ATM proficient cells was not shown. The onset of S412 phosphorylation after etoposide treatment is rather late. To correlate ATM action in this event, authors should compare the kinetics of ATM activation and another ATM target in parallel to ARP8 S412. As in the Discussion, it is plausible that ATR is also responsible for the ARP8 S412 phosphorylation. Phosphorylation analysis in combination with an ATR inhibitor would help to answer this question. To evaluate the phenotype that is influenced by ARP8 S412 phosphorylation and ATM, you should analyze the epistatic relation. Is S412A mutation additive or not to the ATM deficiency or ATM inhibition? For example, does ARP8 S412A mutation increase INO80 and RAD51 binding to the break point and 11q23 translocation increased in BIVA cells or by ATM inhibition in ATM proficient cells? Basically, we feel that there are many over-interpretations of these data throughout the manuscript (title, subtitles, figure legends etc.). Under the current data set, the authors should not state "ATM phosphorylates ARP8", rather than "ATM regulates ARP8 phosphorylation", otherwise authors should provide an in vitro ATM kinase assay on ARP8. 2) Data showing that ARP8 phosphorylation is attenuated by ATMi could be bolstered by examining phosphorylation status of ARP8 in ATM-deficient cells (ATVBIVA). A possible role of ATR in this phosphorylation should be investigated at least by using specific ATRi. 3) Since gammaH2AX recruits INO80 to DSBs, the ChIP analyses in Figure 2 could be extended to gammaH2AX to confirm that etoposide induces DSBs specifically at the BCR. 4) Does the S412D mutant fail to interact with INO80 in co-IPs? That could help explain the lack of INO80 enrichment in Figure 2D. 5) Is the increased INO80 enrichment in Figure 2C altered by ATMi? 6) In Figure 3B, it is difficult to compare interaction of WT and S412A ARP8 as the two data sets are on separate blots. Why does the interaction of WT become apparent only at 4 h, unlike at 2h in earlier blots? 7) Figure 1—figure supplement 1A – it is unclear what is being shown in Figure 1—figure supplement 1A. On the anti-Ino80 IP, the upper band appears to be phosphorylation in untreated conditions and the lower band appears to be a background band that copurifies with IgG. Which is the band we should be noticing? A molecular weight marker is needed on all gels using the ATM/ATR substrate antibody. 8) Figure 1C – why is the reduction of Arp8 phosphorylation not to the same degree as the phospho-Rpa2? Is the ATM/ATR substrate antibody detecting some other phospho substrate? Similar comment for Figure 1—figure supplement 1E – even after treatment with siATM, there seems to be increased signal compared to the ctrl (-etoposide) sample. The reason for this needs to be resolved. 9) Figure 2 – while ChIP results are noted as statistically significant, the change in enrichment appears modest. What are the absolute values (not normalized) of enrichment? How does this (modest) fold change alter downstream genome stability? Similar questions apply to many of the ChIPs in this manuscript. 10) Figure 3B and Figure 3—figure supplement 1B – interaction of Ino80 appears modest. In Figure 3B it looks like it peaks at 2h then is reduced. Please explain why would interaction be reduced after 2 hours? 11) Figure 5 – the translocation results look clear, yet modest. Can the authors provide a point of reference to better judge these results? For example, what translocation rate would be expected upon overexpression or deletion of a repair protein? 12) The model of Arp8 phosphorylation weakening the interaction with Ino80 was a bit speculative, and the IP westerns not terribly convincing as is. We suggest probing for additional subunits in the IP westerns. I believe there are a couple of commercially available antibodies that can be used. 13) The authors should clearly discuss how ATM-mediated inhibition of INO80 and RAD51 loading at BCR serves to suppress translocations. 14) The authors should discuss if such a suppression of RAD51 loading is specific to BCR regions or is applicable to DSBs in general. Thank you for resubmitting your work entitled "ATM regulates ARP8 phosphorylation to prevent chromosome translocations by counteracting DNA repair protein loading at damaged sites" for further consideration at eLife. Your revised article has been favorably evaluated by Jessica Tyler (Senior Editor), Jerry Workman (Reviewing Editor), and three reviewers. Generally the authors have gone to great lengths to perform the requested experiments. Most are carried out adequately, although the results were not fully incorporated into the text and conclusions. In general, the findings are novel and important, as they provide relevant insight into the crosstalk of checkpoint kinases and chromatin remodelers in DNA repair and the phenotypes they monitor are indeed, cancer associated (chromosome translocation). Thus the significance of the paper is appropriate for eLife. 1) New data provided in the revised manuscript suggests that a major kinase responsible for ARP8 phosphorylation after etoposide treatment is ATR (Figure 1E). ATM has a slight effect, but ATR (assuming the inhibitor used is specific) is more important. It is unclear still whether either kinase modifies directly or perhaps is upstream of another kinase. But given the fact that their own inhibitor study implicates ATR more strongly than ATM, the authors should test the effect of ATR inhibition on chromosome translocation. The effect might be more pronounced than ATM ablation. This is a minimal requirement for publication. 2) If ATR inhibition does not affect Rad51 loading then ATM is likely functioning locally at the translocation site, although ATR phosphorylates ARP8 globally. If acute ATR inhibition also influences chromosome translocation, authors should extensively re-write the manuscript so that both checkpoint kinases, ATM and ATR, are implicated in the phosphorylation of ARP8 and the prevention of chromosome translocation. The authors need to provide more detailed information on the conditions used for ATM and ATR inhibitor treatment. KU55933 and ATR inhibitor IV (=VE821, I believe) were shown to be highly selective but ATP competitive inhibitors are non-specific at the high dose. "Checkpoint kinases ATR and ATM regulate Arp8 phosphorylation and attenuate protein factor loading at double strand breaks." Thank you very much for the constructive comments to improve our manuscript. We agree with the reviewers that our findings are not sufficient to indicate the direct phosphorylation of ARP8 S 412 by ATM. Following the reviewers’ advice, we compared the kinetics of ATM activation and other ATM targets, H2AX and RPA2, in parallel with ARP8 S412. As a result, the phosphorylations of ATM and H2AX were detected at 30 min after the induction of DNA damage. In contrast, the phosphorylations of RPA2 and ARP8 were relatively slow, and increased at 2 hrs and peaked at 4 hrs after etoposide treatment (Figure 1B). These findings suggest that ATM may activate other kinases to phosphorylate ARP8 after etoposide treatment. This notion was also supported by the results from an experiment to compare the etoposide-induced phosphorylation status of ARP8 in ATM-deficient BIVA cells and ATM inhibitor-treated ATM-proficient 11-4 cells (Figure 1D and E). The phosphorylation of ARP8 was not completely abolished in ATM-deficient and ATM inhibitor-treated cells. Next, we examined the involvement of ATR in the phosphorylation of ARP8 after etoposide treatment, according to the reviewers’ suggestion. An ATR inhibitor also repressed the phosphorylation of ARP8 after etoposide treatment. This finding suggests the involvement of ATR in the regulation of ARP8 phosphorylation after etoposide treatment (Figure 1 E). Taken together, these results suggest that ATM and ATR regulate the phosphorylation of ARP8 after etoposide treatment. Following the reviewers’ advice, we also examined the effect of ATM inhibition on the ARP8 S412A mutant by the ChIP analysis of 11-4 cells after etoposide treatment, using antibodies against INO80 and RAD51. We could not detect the additive effect of the ATM inhibitor on the ARP8 S412A mutation (Figure 2C–D, Figure 4B-C). ATMi treatment failed to enhance the etoposide-induced 11q23 translocations in ARP8 S412A mutant-expressing cells (Figure 5E). This finding suggests that ATM regulates ARP8 phosphorylation at S412, to regulate the loading of INO80 and RAD51 on BCR after etoposide treatment. In the revised manuscript, the original Figures 4A and 4B are presented as Figure 4—figure supplement 1C and Figure 4A, respectively. We have also replaced original Figure 4—figure supplement 1B with data from six independent experiments. Taken together, these findings suggest that the etoposide-induced phosphorylation of ARP8 at S412 is regulated by ATM and ATR. Accordingly, we have changed the title to “ATM regulates ARP8 phosphorylation to prevent chromosome translocations by counteracting repair proteins loading at damaged sites”, according to the reviewers’ suggestions. Following the reviewer’s comment, we examined the phosphorylation status of ARP8 in ATM-deficient BIVA cells after etoposide treatment (lanes 1-4, Figure 1D in the revised manuscript). As a result, the etoposide-induced phosphorylation of ARP8 was repressed in BIVA cells. Although the basal level of ARP8 phosphorylation in BIVA cells was higher than that in ATM-proficient 11-4 cells (Figure 1D), this finding confirms the involvement of ATM in the regulation of the etoposide-induced phosphorylation of ARP8. We also examined the effect of ATRi on the phosphorylation status of ARP8 after etoposide treatment in ATM-proficient 11-4 cells (lanes 9-12, Figure 1E). We found that ATRi repressed the phosphorylation of ARP8 in ATM-proficient cells. These findings suggest that ATM and ATR regulate the etoposide-induced ARP8 phosphorylation. Accordingly, we have revised manuscript by including these findings. Following the reviewer’s comment, we performed a chromatin immunoprecipitation assay using anti-gammaH2AX antibodies before and after etoposide treatment. The enrichment of gammaH2AX on BCR was observed after etoposide treatment, confirming that etoposide induces DNA damage specifically at the BCR. Accordingly, we have presented this result in the revised Figure 2—figure supplement 1A. Following the reviewer’s suggestion, we performed the immunoprecipitation analysis to examine the interaction between S412D and INO80 in ATM-deficient cells (Figure 3—figure supplement 1B, in the revised manuscript). The interaction of the ARP8 S412D mutant with INO80 was weaker than that of ARP8 WT. The weaker interaction of the ARP8 S412D mutant with INO80 was also confirmed by the Proximity ligation assay (PLA) assay, as shown in Figure 3—figure supplement 2 in the revised manuscript. Accordingly, we have revised the manuscript by including these figures. We performed a chromatin immunoprecipitation analysis of INO80 using ATMi treated 11-4 Flp-in cells expressing either ARP8 wild-type or S412A mutant. 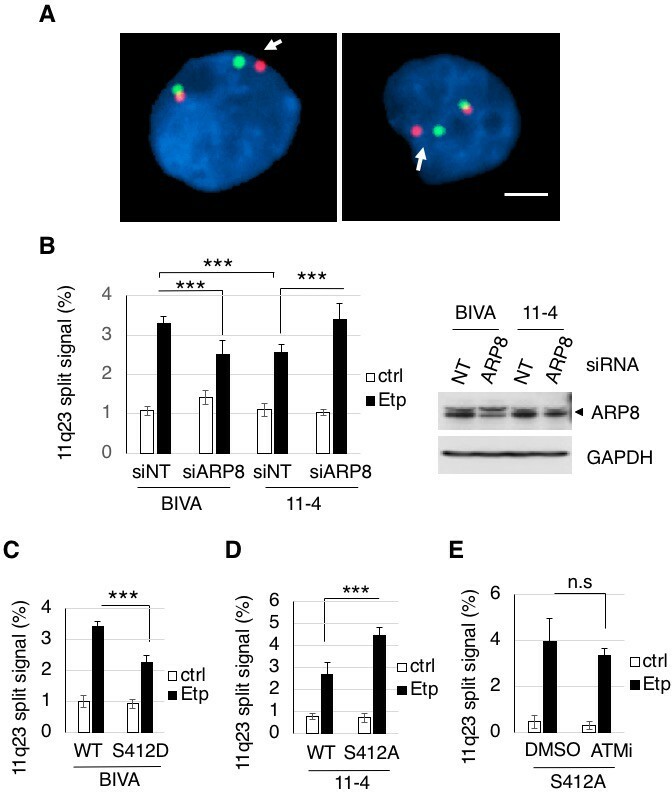 The INO80 enrichment onto MLL BCR was increased by ATMi in ARP8 wild-type expressing cells, while no significant changes were observed in ARP8 S412A mutant expressing cells. This finding suggests the epistatic relation between ATM and ARP8 S412 phosphorylation. Accordingly, the data are presented in Figure 2C and D in the revised version. Following the reviewer’s advice, we applied two sets of samples on one blot. The amounts of INO80 and HA-ARP8 from three independent experiments were quantified, using the Image J software. The S412A mutation increased the interaction of ARP8 with INO80. The gel images and quantitative results are presented in Figure 3B in the revised version. We apologize for the confusing data. We have added a molecular weight marker, and denoted the position of INO80 using an arrow in the revised Figure 1—figure supplement 1A. The upper bands detected by the anti-ATM/ATR substrate antibodies showed no significant difference after etoposide treatment. Since the size of the band is consistent with that of INO80, this upper band could be INO80 with background phosphorylation. The other possibility is that the upper band is non-specific. We agree with the reviewers that the lower band is a non-specific background band. Accordingly, we have revised Figure 1—figure supplement 1A. Thank you very much for pointing out this important issue. There are two possible explanations for this issue. There could be a difference in the detection efficiency of the phosphorylated forms of ARP8 and RPA2. We used antibodies against ATM/ATR substrates for the detection of phosphorylated ARP8. In contrast, we applied antibodies against RPA2 to detect the phosphorylated form of endogenous RPA2, as slowly migrating bands. The other possibility is that ATR is more deeply involved in the regulation of ARP8 phosphorylation than that of RPA2 after etoposide treatment. The phosphorylation of ARP8, as detected by the ATM/ATR substrate antibodies, was completely abolished by the S412A mutation. Therefore, the ATM/ATR substrate antibody should detect the phosphorylation of ARP8 at S412. As the reviewer pointed out, the phosphorylated form of ARP8 was still detected in ATM-depleted cells after etoposide treatment in Figure 1—figure supplement 1E. Since we found that ATR is also responsible for the phosphorylation of ARP8 after etoposide treatment, from the experiments suggested by the reviewer (Figure 1E in the revised manuscript), ATR could facilitate phosphorylation of ARP8 even in ATM-depleted cells after etoposide treatment. In the revised manuscript, we have added the absolute values of enrichment in the ChIP analysis, in Figure 2—source data 1. As the reviewer pointed out, the change in enrichment of INO80 and RAD51 at BCR is modest, but increases chromosome translocations involving BCR. The possible explanation for this is that the binding of chromatin remodelers and DNA repair factors on damaged chromatin is dynamic, not static. Such a dynamic binding could reduce the ChIP value. As in the original Figure 3B, the interaction of INO80 with the ARP8 S412A mutant also apparently peaks at 2h and then is reduced, in the revised Figure 3B. Factors associated with the homologous recombination repair pathway (HR) may be involved in the regulation of INO80 binding to ARP8. The other possibility is that the phosphorylation of ARP8 may facilitate the dissociation of the INO80 complex from damaged chromatin after the appropriate remodeling of damaged chromatin for DNA repair to avoid illegitimate recombination, leading to chromosome abnormalities. These possibilities are discussed in the second paragraph of the Discussion. Following the reviewer’s suggestion, we cited two papers here. One study showed the increased chromosome translocations in RAD51-overexpressing cells (Richardson, Stark, Ommundsen, and Jasin, 2004). The other paper from Mizutani’s lab showed the increased incidence of 11q23 translocations in ATM-deficient cells (Nakada et al., 2006). We have reported that the percentage of the ATM-deficient BIVA cells with the 11q23 chromosome splitting signal is increased from 0.17% to 2.5% by etoposide treatment, and in etoposide-treated ATM-proficient cells from 1.33% to 5.83% after ATMi treatment (Sun J. et al., 2010). I agree that the IP westerns are not convincing. Following the reviewer’s comment, we reprobed the blots with antibodies against ARP5. As a result, similar to INO80, we could observe a slightly increased amount of ARP5 in the S412A precipitated blot, as compared with that of wild-type ARP8 in ATM proficient cells. Similar results were obtained in wild-type ARP8, but not in S412D-expressing, ATM-deficient BIVA cells. Moreover, we also confirmed the role of the phosphorylation of ARP8 in the interaction with INO80 using a Proximity ligation assay, as described above. We would like to present the following data to the reviewers. Examination of the interaction between INO80 and ARP8 in U2OS cells expressing HA-tagged wild-type or S412A ARP8. The endogenous ARP8-depleted cells were treated with etoposide for 15 min. After the cells were washed, they were placed in fresh medium and harvested at the indicated time points. The nuclear extracts were incubated with anti-HA-conjugated anti-mouse IgG Dynabeads. The precipitates were electrophoresed through a gel and probed by western blotting with an anti-INO80 or an anti-HA or an anti-ATM/ATR substrate antibody. The amounts of INO80 and HA-ARP8 were quantified, using the Image J software. The results of quantitative analysis are shown as the relative values as compared to the DMSO control from three independent experiments. Co-immunoprecipitation analysis of ARP8 and INO80. ATM-deficient BIVA cells were co-transfected with the siARP8 and siARP8-resistant HA-tagged wild-type ARP8 or phospho-mimetic S412D ARP8 mutant. After etoposide removal, the cells were recovered at the indicated time points. The nuclear extracts were incubated with anti-HA-conjugated anti-mouse IgG Dynabeads. The precipitates were electrophoresed through a gel and probed by western blotting with either an anti-INO80 antibody or an anti-HA antibody. The amounts of INO80 and HA-ARP8 were quantified, using the Image J software. The results of quantitative analysis are shown as the relative values as compared to the DMSO control, from three independent experiments. Thanks for the important comment. Following the editor’s advice, we examined the effect of the ATR inhibitor VE821 on the etoposide-induced 11q23 chromosome translocations in ATM-proficient 11-4 cells, by the dual color FISH analysis using the MLL gene probes (Figure 6B). The FISH analysis revealed that the increase of the split signal positive cells by ATRi was less than that by ATMi. Although ATR is suggested to be the major kinase responsible for ARP8 phosphorylation after etoposide treatment, this finding suggests that the effect of ATRi on the etoposide-induced chromosome translocations is limited. Moreover, no additional effects of ATRi on the increase of the chromosome translocations by ATMi were observed. 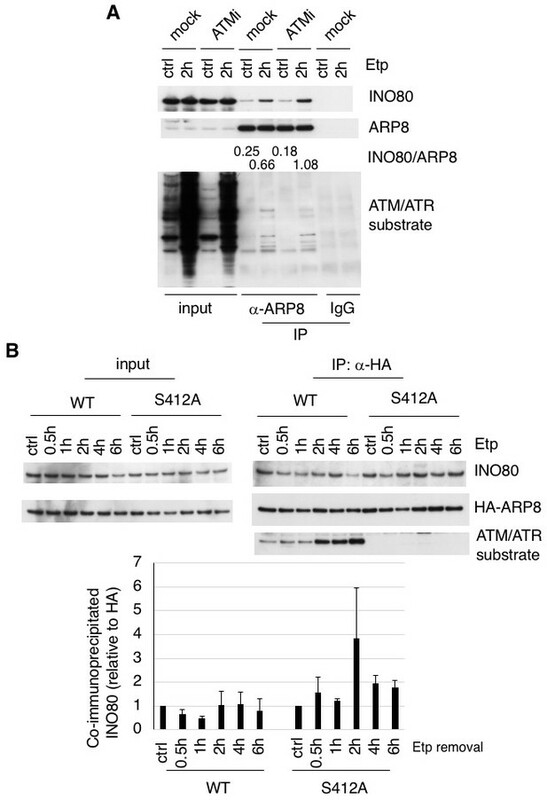 Taken together, these findings strongly suggest that ATM is likely functioning locally at the translocation site, while ATR phosphorylates ARP8 globally. Accordingly, we have added a section “ATM, but not ATR, negatively regulates RAD51 loading onto the BCR after etoposide treatment to repress 11q23 chromosome translocations” in the “Results”. We examined the effect of ATR inhibition on the RAD51 loading on the BCR of MLL in 11-4 cells after etoposide treatment, by a ChIP analysis. In contrast to the increased loading of RAD51 onto the BCR of MLL after etoposide treatment by ATMi, ATRi failed to do so (Figure 6B). This finding is consistent with the results obtained by the FISH experiments described above. As the editors suggested, ATM is likely functioning locally at the translocation sites, while ATR is functioning globally. Accordingly, we have discussed this point in the fourth paragraph in the “Discussion”. We apologize for providing insufficient information about the conditions used for the ATM and ATR inhibitor treatments. We now provide detailed information in the “Materials and methods” and the figure legends in the revised manuscript. As the reviewer speculated, the ATR inhibitor we used was VE821. The FISH analysis and the chromatin immunoprecipitation experiments suggested by the editors showed that ATR inhibition did not change the RAD51 loading onto the BCR of MLL after etoposide treatment, while a slight increase in 11q23 chromosome translocation split signal cells was detected (Figure 6). These results suggest that the ARP8 phosphorylation regulated by ATR is functionally distinct from that by ATM. Accordingly, we have changed the title to “Distinct roles of ATM and ATR in the regulation of ARP8 phosphorylation to prevent chromosome translocations”. This research was supported by JSPS KAKENHI Grants, number JP26430114 to J S, and numbers JP16H01312 and JP15H02821 to ST. This work was partially supported by the Program of the network-type joint Usage/Research Center for Radiation Disaster Medical Science of Hiroshima University, Nagasaki University and Fukushima Medical University, and the Program of the Joint Usage/Research Center of Kyoto University supported by the Ministry of Education, Culture, Sports, Science and Technology (MEXT) of Japan. RK is a member of the Oncode Institute which is partly financed by the Dutch Cancer Society and the gravitation program CancerGenomiCs.nlfrom the Netherlands Organisation for Scientific Research (NWO). We thank S Matsuura and H Kawai for cell lines, H Kurumizaka for suggestions, H Shimamoto for data analysis and H Yamada for manuscript proofreading. © 2018, Sun et al.